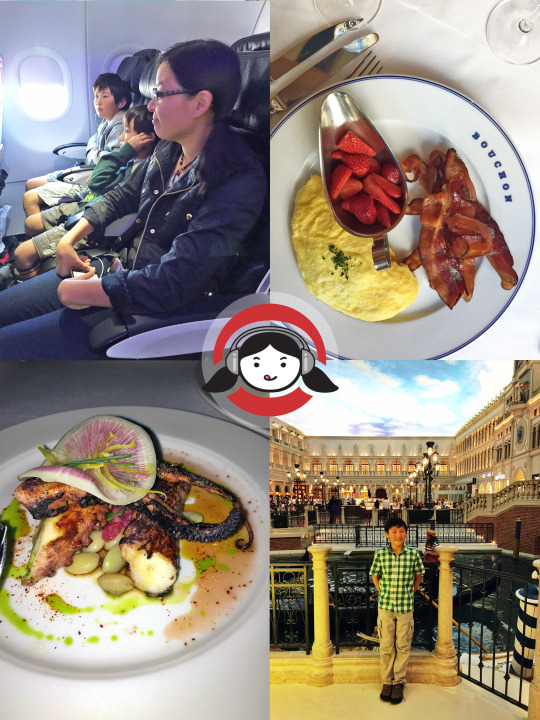 Podcast Episode 7: Traveling While Paleo! Let’s face it: no matter how many costumed characters roam the Strip, Las Vegas ain’t the most kid-friendly vacation spot in the world. Still, our family decided to take a surprise weekend trip to Sin City to attend a “Weird Al” Yankovic concert. In this episode, the kids gleefully fill everyone in on what they ate and observed in Las Vegas. 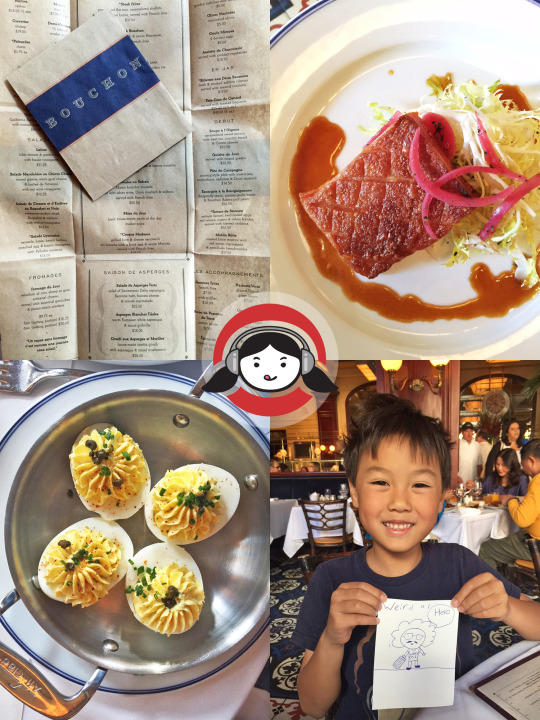 Big-O loved the steak and eggs at Bouchon Bistro, as well as the seafood options at B & B Ristorante. Travelers: we’ve got tons of tips and tricks for you on how to stay Paleo on the road! In this episode, we tell you how we scope out Paleo eats when we’re out and about. The amount of food I pack in our carry-on luggage depends on the length of the flight. If it’s a short flight, I typically bring a small bag of non-perishable snacks (e.g., a packet of jerky, salami, dark chocolate, seaweed, snack bars, or nuts). For longer flights, I simply increase the amount of snacks in my bag—or I purchase something at the airport. I also bring some of my favorite condiments and seasoning, assuming our final destination has a kitchen. When I’m taking a short flight, I usually don’t eat anything at the airport. On longer trips, or when I’m stuck at the airport on a layover, I’ll seek out portable grub by going online and searching Yelp or Trip Advisor for gluten-free options at the airport. Other great resources for top airport eats include this article in the Wall Street Journal, and this post in Thrillist which rank airports by their food and drink options. At San Francisco International Airport (SFO), opt for the takeout choices in Terminal 2. Some of my favorite options are Lark Creek Grill, The Plant Cafe Organic, Napa Farms Market. At Denver International Airport (DEN), check out the locally sourced gluten-free friendly eats at Root Down. At Austin-Bergstrom International Airport (AUS), chow down on a BBQ platter (hold the bread and beans) at The Salt Lick before boarding your flight. I don’t always eat during flights, but I routinely request bottled still or sparkling water (with no ice!) as my beverage. The reason I leave out the ice is because the ice is often contaminated with harmful bacteria. If you’re hungry and didn’t pack any food, most airlines sell gluten-free snacks that can tide you over until you land. (For example, Virgin America offers gluten-free snack packs, Hail Merry nuts & macaroons, and jerky.) I once made the mistake of ordering a gluten-free meal on an international flight and I was disappointed that all I got was a bunch of tasteless rice cakes. It turns out that most airlines will serve the same meal to anyone who requests a special meal due to a dietary restriction—which means a gluten-free meal will also be devoid of fat, salt, animal products, and, well…flavor. Our drive from the airport normally includes a pit stop at a local grocery store before we reach our vacation rental. We usually stock up on breakfast items (e.g. eggs, sausage, butter, pre-cut fruit and produce, cold brew coffee) and grab-and-go snacks. Now that we travel with kids, we choose to stay at a vacation home or condo instead of a hotel room because we prefer getting more space at a reasonable price. Plus, we can start our day off right with a hearty homemade breakfast that doesn’t break the bank. If you’re staying at a hotel, you can still prepare some meals in your room. Simply call the front desk ahead of time and request an empty refrigerator to store your perishables. Also, you can evidently cook lots of different things with the appliances in a hotel room (though to be honest, I haven’t tried this—yet). I use Yelp to find the closest grocery store between the airport and our vacation rental. We’ve had lots of luck with vacation rentals through Airbnb and VRBO. If you want to learn how to cook with hotel appliances, check out this article. I’ve always been a gastrotourist, and my prime objective when vacationing is to find and taste the best local cuisine. In this segment, I reveal how my research starts before we leave on our trip. I start by checking local newspapers and online magazine for the top places to eat in the past year. Next, I narrow my choices after reading the latest restaurant reviews. Finally, I ask my readers for Paleo-friendly restaurant recommendations via Twitter, Facebook, and Instagram. After sifting through all the data, I curate a restaurant list for each city, and figure out how to combine sightseeing with the restaurants on my list. My favorite sites for restaurant research are Eater, Zagat, Time Out, and local newspapers. You can be the ultimate gastrotourist and dine at the World’s 50 Best Restaurants. Read the latest reviews and learn about gluten-free options via Yelp, Trip Advisor, gluten-free blogs, and gluten-free apps. Learn how to eat gluten-free at Disneyland and Disney World. The Double-Os discuss how much they enjoyed the “Weird Al” Yankovic concert in Las Vegas and their favorite songs at the show. Afterwards, Big-O and I talk about how much we love cherries—specifically, Bing cherries. Find a Weird Al show near you! I like to buy our cherries from CJ Olson’s in Sunnyvale because that’s where my mom used to buy them when I was a kid. Pro tip: store cherries the same way as strawberries. Listen to our first podcast episode to hear how I keep them fresh for up to two weeks. If you’ve got some extra cherries, make my Smashed Steak Skewers with Cherry Barbecue Sauce! Is it possible to eat Paleo at a dim sum place? As a Chinese-American, that is the one meal/cuisine that I love more than anything else. Can you help me maneuver through the different choices? In all honesty, it’s really hard to eat gluten-free dim sum, let alone Paleo—though there is a restaurant in New York City called Nom Wah where certain dim sum items are labeled as gluten-free. I haven’t tried the restaurant because I don’t love dim sum, but it looks promising. That’s right—I’m not a dim sum fan. But if you are, and it’s worth it to treat yourself to a dim sum meal, don’t stress out about whether it’s Paleo or not. Just be mindful of your food choices, and once you’ve made the choice to take a delicious detour, be sure to savor every bite! Ciao for now! If you like what you heard, subscribe to our podcast and leave us a review on iTunes! And don’t forget, you can get TWO months’ free membership and 25% off your first order at Thrive Market by clicking here. How great is that? Previous Post: « Nom Nom Paleo on Vice Munchies!